15 activities for you and the family to do this Easter, hand-picked by Absolute Escapes. Finally, after what felt like a never ending winter, spring is here! The days are stretching out, temperatures are rising, and flowers are blooming all over. And Easter is just around the corner. What better time to gather your loved ones and head for the country's favourite national park? The improving weather means it's the perfect opportunity to bag some fells (here's 5 Lake District fells we recommended earlier). But if that's not your scene, or you fancy giving something else a go, there's a plethora of events and activities to keep you occupied in the Lakes this Easter. You can soak up some culture, learn a new skill or give the kids a truly special experience. We've handpicked some of the most exciting events and activities you can enjoy in the Lakes over the Easter holidays. Thinking of coming, but still need somewhere to stay? Have a look at Absolute Escapes Lake District holiday cottages, or Eden Valley cottages. Go and see this explosive new British musical, with soaring vocals and spectacular street dance in a family-friendly performance in "the most beautifully located and friendly theatre in Britain", with spectacular views of the fells from its shore. Explore the Everchanging Forest, help the fairies find their shadows, track the dinosaur footprints and name the lambs and finish your journey with a drink & snacks in the Woodland Café. Head up to the border city for a bit of crafty fun at museum and cultural hub, Tullie House. Activities include wool painting, paper flower collage, paper chicks craft and Easter egg painting. What’s better than Easter eggs? That’s right, dragon eggs. Follow the dragon around Lowther Castle grounds and collect all the eggs it lays. You could win a chocolate-y prize. Over the Easter holidays, you can drop in between 10am and 5pm and take part in the quest. You’ll need to imagine yourself in the feathers of one of the resident birds, and explore what life’s like for each of them around the grounds. The quest is free when you buy tickets for the castle (which is always worth a visit!). Head to Rheged and help them name their resident chicks in a viewing incubator with eggs hatching every day and enjoy lots of other Easter activities and events including “Build your own bunny“ and “Peter Pan Treasure Trail“. Cadburys and the National Trust are teaming up to offer a range of Easter egg hunts at a range of locations in the Lake District and Cumbria over the Easter weekend. Enjoy breathtaking locations while your kids hunt for delicious Cadbury's chocolate prizes. Egg hunts take place all over the Lake District. Find your nearest egg hunt here. Head out west for sea and discover not only the past, present and future but also some great family workshops and events including Storytelling, Michael's Magical Menagerie and Printmaking for Beginners. Performed entirely on and under a kitchen table, this wee wonder of a show is full of Lyngo magic with feathery spinning birds, a flying house and a portable forest. CBeebies Patrick Lynch, who has been performing it for more than a decade, brings this classic story to life in a playful and fascinating show. Cumbria’s premier food festival comes to Kirkby Lonsdale. You’ll find up to 80 stalls packed with delicious foods. One weekend almost doesn’t seem enough to take it all in. Every child travels free when accompanied onboard with their teddy and an adult with a valid Cruise All Piers pass. There's also a teddy trail on offer. Can you locate all of the bears? Kids with teddies get free entry to Muncaster Castle over Easter weekend! 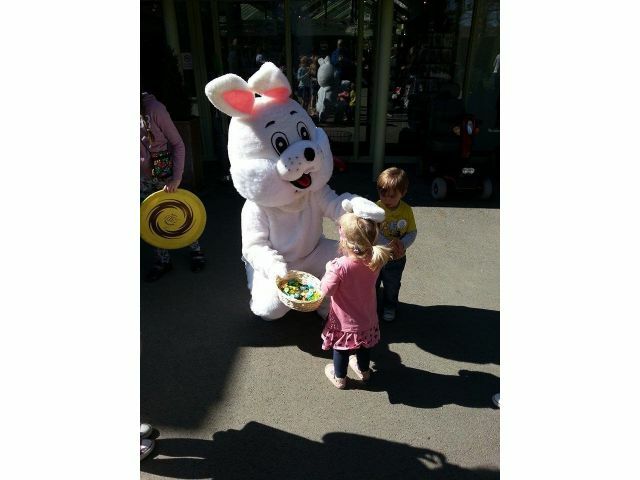 On Easter Sunday and Monday the Giant Easter Egg Hunt takes place at 12.30, with prizes for all participants. Entry into the hunt costs a small fee and places are limited so be sure to book yours as soon as possible. One of only five days of the year that you can visit the secluded isle and the luxurious Georgian house at its centre. After paddling across Derwent Water by canoe, you'll receive a 45 minute guided tour of the house. Afterwards, you can explore the gardens and the island as you like. There are eight slots available to book throughout the day, so make sure to book so you don't miss out a chance to experience this unique locale (ages 8 and up). Hunt the Herdy! The adventurous Herdy sheep have escaped! They need your help to find them all before the end of April. Great outdoor fun for all the family! And if you love hunting come back for the Easter weekend to go on the famous Brockhole Giant Easter Egg Hunt! The exhibition explores the nation’s change from war back to peace, with a focus on art created by people from the local area. The exhibition presents paintings by David A Baxter of Borrowdale, an official war artist; both from his work during the 1st World War in France and the peace at home in Cumbria. As well as enjoying all these activities, Easter also gives you the opportunity to enjoy something a little less structured: the hunt for a perfect bluebell picture. Spring and Easter time mean there'll be bluebells in abundance in Cumbria. Like a brilliantly blue natural carpet, bluebells cover the ground in the spring months. And make for some truly remarkable photos. April and May give you your best chance to find them. Three Cumbrian places notable for their bluebells are Rannerdale Knotts near Buttermere, Low Wood by Wastwater and Rusdale Valley near Newby Bridge. Have a look in these locations and you're almost guaranteed to be greeted by a floor full of the blue flowers. Or why not try and find your own little patch? Bluebells are common in woodland areas, think of the adventure you could go on to get the perfect photo? Already got some beautiful bluebell photos? Why not send them to us and we can feature them on the Absolute Escapes Facebook page. Got anymore exciting things to do in the Lakes at Easter? Let us know on Facebook or Twitter and we'll see if we can improve our list. 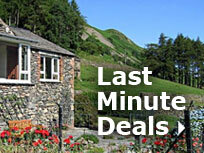 Not long left til Easter now, but if you're still looking for somewhere to stay, why not have a look at Absolute Escapes last minute Lake District holiday cottage deals? Shirley Thomson is the owner and director of Absolute Escapes Lettings and has been for over ten years. Her passion is for the Lake District, so she established Absolute Escapes to offer a personal service to those wanting to stay in the Lakes. She deals with every part of the business herself from finding cottages and managing bookings. If you're looking for a Lake District cottage or an Eden Valley cottage, Shirley's the woman for you.